Do you have a millennial in your life? If you do, you know that this generation uses technology all the time. From online jobs to laptops on the kitchen table, and earbuds always in their ears, they interact with their technology more than you ever thought possible. While technology has done wonders in connecting us with people all around the world, the truth is that heavy technology use could be harming millennials hearing – and more. Sadly, technology has been closely linked to hearing loss in many recent studies. Listening to music, podcasts, or the best workout soundtrack might bring millennials a lot of joy, but sadly this constant need to be plugged in could be damaging their hearing. Millennials, those born in in 1980s and 1990s, have adapted to technology far more easily than older generations, and they use this technology to help them navigate around the city, find the best deal on an important purchase, or connect with new people. However, experts say that technology could have some negative drawbacks. The Centers for Disease Control and Prevention report that hearing loss is among the most common of chronic health conditions in the US, and more than ever before hearing loss is affecting people at younger ages. The nearly universal use of personal listening devices is putting millions of people at risk of hearing loss, and children, teens, and adults are always reaching for the volume control. They often turn their music up to unsafe levels to drown out annoying background noises, and usually listen at too loud a volume for far too long. 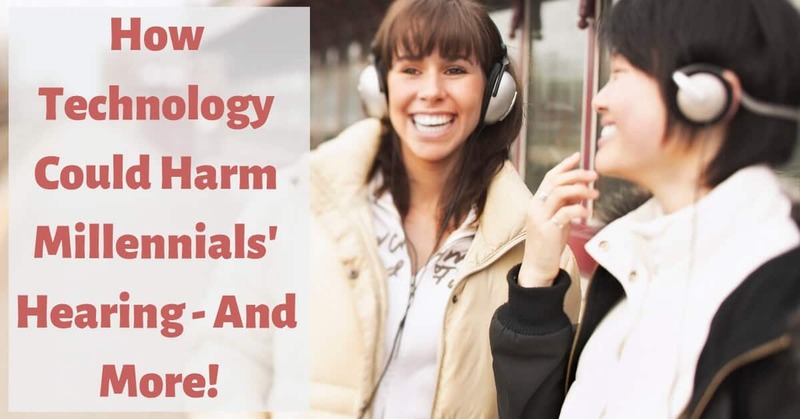 This leads to hearing loss and tinnitus, and once you have hearing loss there’s no way to restore hearing, so making millennials more aware of the risks could be saving their hearing health. If you’ve been listening to a lot of music recently, it’s important that you take steps to protect your hearing health. Limit the amount of time you spend listening with earbuds, and employ the 60/60 rule. Listen for 60 minutes and then take a break to give your ears a rest, and never listen with the volume higher than 60%. Any higher, and you risk damaging your hearing. If you work in a loud job, or enjoy noisy leisure events like concerts, sports events, driving motorbikes, or heading to the shooting range, be sure you’re always wearing hearing protection, and encourage those around you to do the same. Technology could be harming more than just millennials hearing, it could also be affecting their mental health. Being connected seems like a great thing, but sometimes being so connected online can make it harder to connect in real life. Many millennials are more comfortable sending a text than talking on the phone or meeting friends in person, and millennials are more likely to suffer from social anxiety, stress, social isolation, loneliness, and even depression. In fact, a recent study by the Blue Cross Blue Shield Association found a 47% increase in millennials suffering from depression in the past few years. If the millennial in your life is over using their technology, it’s possible that they’re not in great physical health. Technology users are more likely to lead sedentary lifestyles, stay indoors more, and have far less physical activity. Millennials are more prone to obesity, diabetes, high cholesterol, heart disease, and high blood pressure. Spending many hours using technology is also extremely bad for posture. Hunching over computers or phones all day leads to problems in the neck, back, and spine, and can cause more serious physical and mental problems. Technology might be the culprit in causing worse hearing and more, but it is also the solution to your hearing loss. Hearing technology has improved in leaps and bounds in the past few years, and today’s devices are sophisticated, tiny, brilliant pieces of technology that will change the way you interact with the world. If you’re struggling to hear, can’t follow conversations, and feel like your loved ones are slipping away from you, visit us at My Hearing Centers for a hearing test, and find out how technology can help you hear.